The gang members were shown two doors and told to choose. One led to the cells - and the other to freedom. But unlike the average criminal passing through Wood Green Crown Court, these youths were there voluntarily. Police had invited members of Enfield's Get Money Gang (GMG) to the court. Perhaps surprisingly, 10 - a third of those contacted - turned up. They were not facing trial, but a hard-hitting and gruesome testimony to the realities of gang crime. It is the first time the tactic has been used in England or Wales, but Glasgow police said violent crime dropped 50% among attendees of gang "call-ins" they had held in the Scottish city. The gang members ranged in age from 14 to 20 - and at first there was joking in the dock. "Is it funny?" Ch Insp Ian Kibblewhite, of Enfield Police, demanded. But the giggles subsided into saucer-eyed silence as images of knife crime victims began to be displayed. One man was half-decapitated - another had a carving knife thrust into his torso. And it was deathly quiet when Nicola Dyer - mother of gang murder victim Shakilus Townsend - addressed the room. "I used to consider myself an ordinary mother," she said. "There's nothing ordinary about my life now. "The other day I dreamt he was in trouble - I woke up and my first thought was, 'it's OK, he's in bed'. "It took a few moments to remember he has not been in his bed for three years." Ms Dyer said when 16-year-old Shakilus died in July 2008 her youngest children did not understand what was going on. "I am now having to answer questions about how their brother died," she said. "Did he die in hospital? Or was it when he was attacked? "Questions I never thought I'd have to answer." She added: "When he died there were comments that he was a 'soldier' - but there's nothing soldier-like about being run down in the street like an animal." As if to underline the immediacy of the gang problem, a 15-year-old boy was stabbed multiple times on the same street as the court that very day. In the past year there have been three youth gang-related murders in the borough. Jermaine Jones-Lawler, an ex-gang member, told those in the dock: "I had a mentality where I did not care what colour your bandana is or what your hand sign is. "Whatever you had I would take it - if that meant stabbing you, I would do it, I didn't care." Mr Jones-Lawler continued: "When a man is holding a gun to your head, where are your man dem [friends]? They are running off. "Let me tell you about 'man dem'. When you're in prison, they're not writing to you or sending you money. "They are [sleeping with] your girl and spending your money. "When I was in hospital with my eyeball hanging out where were they?" Frank Cross, a former trauma surgeon at Royal London Hospital, described how hours operating on a knife victim led to the death of another patient. 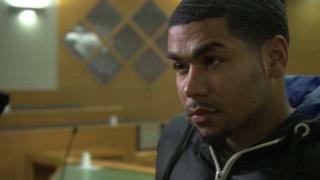 He said: "It was a girl who had been stabbed in a mugging because she would not hand over £20. "The first man on my operating list had a swelling on his blood vessel - but we couldn't do him. "The intensive care unit was half-full of people who had been stabbed or shot." He continued: "On Wednesday the bloke with the swollen blood vessel had it pop - and he died. "The girl went through five operations. She didn't have enough gut to survive. "She went home with a bag sticking out of her stomach and her chances of a normal life were ruined." The gang members were outnumbered by journalists, and dozens of police lined the courtroom. "If you make the wrong decision after tonight, trust me, we are coming after you," warned Ch Insp Kibblewhite. "We know who you are. "You might have 100 people in your gang - we have 32,000 people in our gang. It's called the Metropolitan Police." He continued: "If you make the wrong decision and you live in an Enfield Homes [council] property, you might not have it any longer. "If your parents are on benefits we might be coming to see if they are lawful. "Eighteen years ago Stephen Lawrence got murdered, 18 years later we brought them to justice. That's how long our memory is." Police consider GMG one of the two most dangerous gangs in Enfield, saying it is responsible for numerous incidents of grievous bodily harm. Enfield Council's Christine Hamilton, also a local magistrate, said: "The idea is for them to understand the consequences of their actions. "Provided help and support many would move away from gang culture." Judge Shaun Lyons told those in the dock: "You have a choice to make. Go away and think about it. "When you leave the dock you will go to your friends and back on to the streets. "If you make the wrong choice the next time you are back in that dock will mean years of your life in cells." A further two call-ins are planned for local gang members, using a £10,000 Home Office grant. Whether they will grab a headline or make a real difference, only time will tell.